Picture Resizer can be used to resize pictures. Picture Resizer is an expert in resizing images, the resizing process can be done only by some easy clicks. Picture Resizer features: 1.Support all the windows Platformas: such as Windows 2000 and later systems, both 32bit and 64bit systems, XP, Window 7. 2.Sharpen your blurred photos to recover details. 3.Stamp images in batch with text that is defined font manually. 4.Support output formats:BMP, PCX, GIF, PNG, TIF, JPG, ICO, J2K, TGA, etc. 5.Image conversion forms:such as bmp to gif, bmp to jpg, bmp to png, bmp to tga, gif to jpg, gif to png, gif to tga, tif to gif, tif to jpg, tif to png,etc. 6.Fix Image:the images will be resized according to the original proportion referring to the smaller value between width and height. 7.Rotate images with 90 degree, -90 degree, 180 degree in batch. 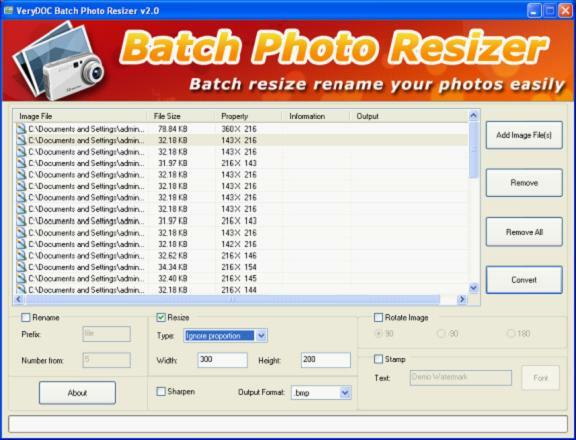 Picture Name Editor can be used to resize image files in batch. It supports to resize hundreds of image files at a time. This site does not contain serial number, crack, keygen Picture Resizer serial number : serial number is the simplest type of crack. A serial number(cdkey,product key,etc) is register the program as you may already know. a crack or keygen may contain harmful software. If you cannot find the exact version you want, just give it a try. for more information read .nfo/.txt/.diz file include in zipped file.